Tories promise more pain ... Kick out the 'nasty party'! The Trade Unionist and Socialist Coalition has announced its candidates for the Mayor of Bristol election and the Manchester Central parliamentary by-election that will take place on 15 November. Manchester Central will be contested by Alex Davidson, the vice-chair of the PCS civil servants' union North West Region and a former member (2011-12) of the PCS Public Sector Group Executive Committee. TUSC's candidate for the Mayor of Bristol is Unite member Tom Baldwin, a previous TUSC candidate in local and general elections, who is set to be the youngest candidate in the field. The TUSC national steering committee, meeting on 3 October, also agreed to seek nominations for a TUSC candidate in the Croydon North by-election, caused by the death of the sitting MP. The date for this election has yet to be formally decided but, assuming that it too will be 15 November, applications to be a TUSC candidate in Croydon need to be submitted quickly. 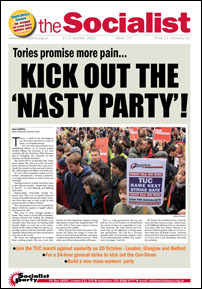 TUSC was set up in 2010 to enable trade unionists, community campaigners and socialists to stand candidates against the pro-austerity establishment parties. It is a coalition with a steering committee which includes, in a personal capacity, the RMT general secretary Bob Crow, the general secretary of the POA prison officers' union, Steve Gillan, and national officers and executive members of the PCS civil service union, the Fire Brigades Union, and the National Union of Teachers. The Socialist Party and the SWP are also represented on the committee. TUSC is a federal 'umbrella' coalition, with agreed core policies that include a clear socialist commitment to "bringing into democratic public ownership the major companies and banks that dominate the economy, so that production and services can be planned to meet the needs of all and to protect the environment". Help fund TUSC's election challenge! Just to appear on the ballot paper in the Manchester and Bristol elections will cost TUSC £1,000, and a further £750 for two pages in the manifestos booklet that will be distributed to every household in Bristol for the mayoral contest. So that's £1,750 before a single leaflet has been printed. Can you make a donation to the national election fund? There's a PayPal facility on the TUSC website (www.tusc.org.uk/donate) or you can send cheques, made payable to the Trade Unionist and Socialist Coalition, to TUSC, 17 Colebert House, Colebert Avenue, London, E1 4JP. Let's make sure TUSC isn't held back from making the biggest possible impact in these elections! As a socialist, I see the history of the working class intertwined with the personal history of my own family. My family has been involved with the labour movement since its early days. My grandfather was a lifelong Marxist and Labour Party member, attending classes of the socialist and Marxist John Maclean at the turn of the century. In 1917 my grandmother joined the Labour Party to campaign for a better life for ordinary people. This was one year after my mother, her seventh child was born. She had eight children and became a single parent- she had a hard life. In 1924 my mother broke her leg and my grandmother broke the only chair in the house to make a splint. An older boy in the street carried my mother part of the way to the hospital as they only had enough fare to take the tram part of the way. There was no NHS in those days! In 1929, my grandmother stood as a Labour councillor in Heaton Ward, Newcastle-upon-Tyne. She campaigned against unemployment, for better housing, for the right for all to free secondary education and the opportunity for a university education. My mother had passed her 11 plus but there wasn't enough money for a uniform to send her to grammar school. Grandma called for public control of gas, water and electricity. She made socialism her life's work and was five times president of the Northumberland Labour Party Women's section in the 1930s. She must have been euphoric when the 1945 Labour government was elected and brought in the Welfare State. My mam and dad were also lifelong members of the Labour Party as well as supporters of Militant, the forerunner of the Socialist. They were horrified when Thatcher came to power, knowing what painful cuts the Tories are capable of inflicting on the working class. I can see the hopes and dreams of generations of my family being brutally destroyed by this Lib-Con government. The gains that the working class have made through the tireless campaigning and sacrifice of generations of ordinary people are being stolen from us to serve the interests of the rich and powerful. Three generations and 100 years of campaigning for a better life for ordinary working people and the Tories are callously taking all this away from us. We need a party that will stand up for the interests of the working class. We have heard much from all the main political parties about claiming to stand up for the forgotten middle class. But who is standing up for the working class? The Trade Unionist and Socialist Coalition truly defends the rights of ordinary people.